Whether you’re a fully paid-up member of the Clinton’s card club or refuse to even acknowledge Valentines Day exists (no one’s robbing YOU with double-priced roses! ), none of us can ignore declarations of love floating around at this time of year! So maybe you’re wondering how cleaning out your spice cupboard is going to add any spice to your life? Well it probably won’t, but living or working in chaos can deeply affect your mood and feeling of wellbeing. Getting rid of those outgrown baby clothes or making a dent in the desk paperwork will feel wonderful once you have space to breathe! Failing that, put your feet up and watch Tidying Up with Marie Kondo and have a virtual tidy! Who’s got time for a spa day? Not me! But even if you’re pushed for time, doing simple, pleasurable things like running a bath, lighting a candle and having a deep soak has the most amazing affect on our happiness receptors. Always the multi-tasker, I like to put a face mask and hair mask on while lazing in a moisturising tub of Splendidly Soothing Bath Soak then I apply a body oil such as and marvel as its sinks in immediately! It’s a great self-care tip to do a weekly audit of who you follow and why! If someone’s posts make you feel, well, just a bit ‘meh’ and crappy about yourself then what’s the benefit in following? It’s worth bearing in mind that when we’re feeling a little wobbly about our relationship, then it’s not always going to be helpful to scroll through umpteen declarations of undying love and over-the-top romantic gestures. Remember it’s not the law to be sitting in an over-priced restaurant with your loved one. You could be eating a microwave dinner on your lap, watching a box set if that’s your thing, (or even watching a Disney film with the kids), or, having your mates round for a glass of something. The rules are, there are no Valentine’s rules, no matter how much those sneaky marketing folks tell you otherwise. As we get older, our friend count may shrink but the ones we do have, have well and truly earned their place in your heart. So how about sending a few texts to your bestest mates and telling them what you love about them? It’ll make you both feel good. Just as we learn to surround ourselves with good eggs for friends, saying ‘no’ to the stuff we don’t want to do is a really important aspect of self-care Easier said than done? Practice with a trusted friend first and remember you don’t have to have specific reasons for saying ‘no’, you are allowed to just ‘not fancy it’. Here’s a thought, imagine a day where you didn’t put everyone else first? OK, so we love our other halves, our kids, friends and family, but do you ever start to feel so put upon that you feel even the pet hamster gets more attention than you do? Time to do a ‘me first’ list, the kids may even think it’s a novelty! Why not try answering to the plea of ‘play with me mummy!’ to ‘I will Darling but not until this brilliant episode of Corrie/Neighbours/Suits has finished.’ Utter rebellion! Sometimes, all you need to feel pampered is to actually HAVE FIVE ACTUAL MINUTES JUST TO THINK! (Said in shouty type because having no time can drive you nuts!) Take your foot off the gas and make a list of stuff that would make life a little less frantic. Maybe it’s sharing the nursery run with a mate? Getting up half an hour earlier? Doing an online supermarket shop instead of wrestling around the aisles? Get a recipe box meal delivered? (I have a friend with a newborn and she swore by them for those first few exhausting months. Brainstorm three things that could make life easier. I find it a chore but I plan all my meals when I have a bit of downtime over the weekend so that frantic week days feel a little less, well, frantic. 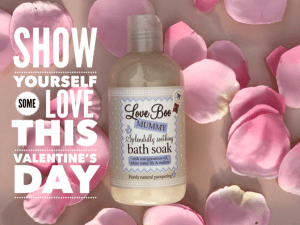 But whatever happens this Valentine’s day, it’s good to remember it’s just a day and whether you’re feeling the love or just want to survive until the 15th, practising a little self love is a good year-round habit for us all to get into!